Super Step Contour: The newly designed SSC's goal is to reduce the trubulence for the rider and passenger and reduce the wind noise, while keeping the classic good looks of the FLHT intact. 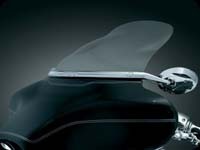 The SSC reduces the distance from the shield to the rider with redesigned contour to redirect wind away to the sides of the rider as it exists the trailing edge of the shield. The height is measured along the contour. To achieve the equivalent HD type shield height, you should add 3" to the SSC height, i.e. if you use a 9" HD shield, you would want to get a 12" SSC. Note: Some windshield pocket pouches may not fit with this shield. HD 8": pullback 4.75", height 15.5", SSC 11": pullback 8.25", height 15.5", SSC 12": pullback 8.5", height 16.5", SSC 13": pullback 8.75", height 17.25"
Flare: The "hips" at the outer edge of the shield re-route the wind to add downforce to the front of the bike, which aids stability vs. using a stock shield. 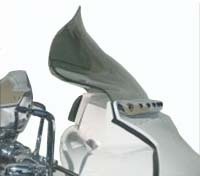 The "flip" at the top of the FLARE is designed to kick the air up and then allow it to flow back as "clean" air for the rider. The FLARE was designed to compete with the short stock shields. The FLARE kicks the air out to the sides and up, allowing the wind to come back at the rider in a much cleaner fashion. 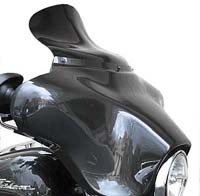 Note: Radar detectors and GPS systems that are mounted in the fairing mount position will not fit with the Flare Windshield. 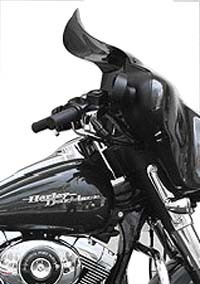 Custom molded from premium quality, hard-coated polycarbonate to provide unmatched durability, and pre-drilled for easy mounting using stock windshield hardware. Available in 3.5" 6.5", 8.5" and 11.5", measure from center bolt hole to start of the lip. The new WK-8.5 model allows installation of a Windshield Pouch because of the additional non-curved section at the bottom of the windshield. 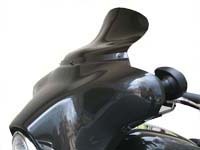 Aerodynamic Step: Give your Electra Glide or Street Glide an entirely new look. This new Aerodynamic Step Windshield has an unmistakable look & inproves wind protection at the same time. Short windshields definitly look good, but the buffering & wind noise can be annoying. This design features another option sweptback profile, a wedge-shaped raised center section, & a slightly flipped trailing edge. Measures 14 inches along contour from center mounting hole to the top, or 6 inches from the base to the top measured straight up.